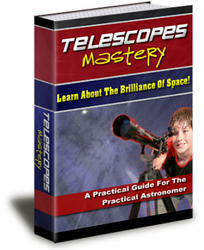 The concept of solid angle Q is fundamental to all of astronomy. It is simply an "angular area" on the sky, or equivalently, on the celestial sphere. This area can be expressed as "square degrees" or "square radians"; the latter unit is called the steradian. The solid angle is expressed in terms of two angular displacements, e.g., d9 and d0 in Fig. 7. The beam of an antenna, e.g., 1° x 1°, or 1"x 2", or a "fan beam" of 1° x 100° can be characterized by its solid angle, approximately 1 deg2, 2 arcsec2, and 100 deg2 for these cases respectively. 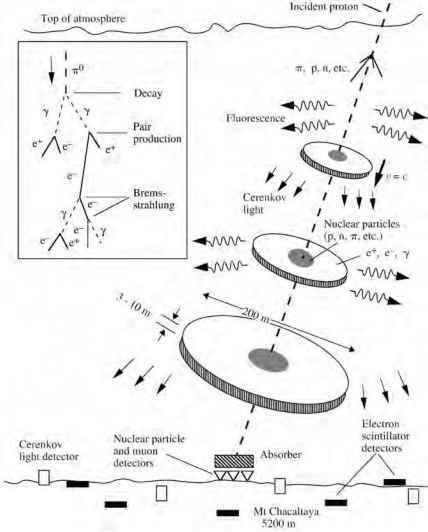 Figure 3.7. 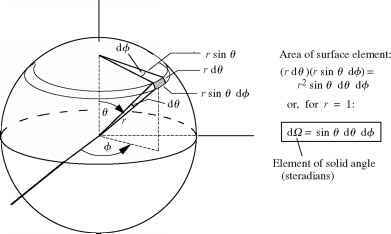 The concept of solid angle, Q, which is the "angular" area on a sphere. The element of solid angle dQ (hatched area) can be expressed in terms of steradi-ans (or "square radians") which is numerically equal to an element of surface area on a sphere of unit radius. Integration over the entire sphere yields a total solid angle of 4^ steradians. We refrain from saying that a region of 1 rad x 1 rad on the celestial sphere has a solid angle of 1.0 sr. Such a statement is incorrect because the celestial sphere is not a flat surface. This provides a more basic definition of the steradian. It is 1 the area of a sphere of unit radius. For small solid angles (<100 deg2 = 0.03 sr), the approximate solid angle in steradians is obtained simply by calculating the area on the sky, in square radians, as if the sky were a flat piece of paper. Thus a square 1° x 1° region on the sky would have solid angle close to (1/57.3)2 = 3 x 10-4 sr. For solid angles that are this small, the approximation is excellent. This can be integrated over any desired portion of the sphere to obtain the solid angle, keeping in mind that the limits on 9, 0 must be given in radians. The integration is not difficult for areas with certain symmetries so that one integration variable can be held constant while the other varies. An example is the calculation of the solid angle of a polar cap of 30° radius (9max = 30°). For arbitrary shapes, piecewise summation may be required. It is important to have a sense of solid angle. Star and galaxy numbers are often quoted as the number per steradian. The number of a certain object one might find in apiece of the sky depends on the size of the solid angle searched. Solid angle also is the basis of the formal description of the brightness of diffuse objects described in Chapter 8.
Who is mean by solid angle and how it determined?